How to apply to the lab? Cell-cell fusion is central for fertilization during sexual reproduction. It also underlies the formation of some tissues, such as muscles, during development. We study how yeast gametes fuse to produce the zygote during mating. The fusion of fungi – non-motile cells encased in rigid cell walls – can be divided in three stages. First, the cells signal their position by acting as source of pheromone and polarize growth towards each other to achieve cell contact. Once cells have paired, they need to digest their cell wall at the zone of contact, leading to plasma membrane apposition. Because the yeast cell wall offers protection not only against external insults but also against lysis due to high internal turgor pressure, the time and location of wall digestion has to be controlled. Finally, the plasma membranes merge together to unite the two cells in one. Re-organization of the actin cytoskeleton is critical for local cell wall digestion. 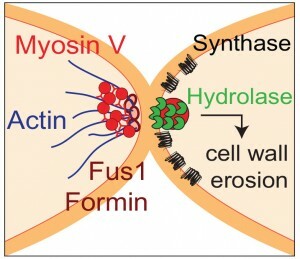 Fission yeast cells organize a specific actin structure – the actin fusion focus, an aster-like organization of actin filaments nucleated by the formin Fus1, which allows the focalized accumulation of type V myosins. One likely important cargo for the myosins are vesicles containing glucanases, enzymes that digest the cell wall. By contrast, cell wall synthases, which catalyze the formation of bonds between glucan polymers, are more broadly distributed at the cell-cell contact site. We propose that this geometric separation of cell wall hydrolases and synthases achieves the local cell wall digestion required for successful cell-cell fusion. The fusion focus is also a site of pheromone communication and local signaling. The positive feedback established during cell pairing is extended here: the fusion focus localizes the pheromone signaling pathway (pheromone transporter, receptors and MAPK cascade), which in turn promotes focus stabilization. Thus, local MAPK activity stabilizes the focus, concentrating pheromone release, leading to enhanced receptor-Ras-MAPK signaling, in the partner cell, which further stabilizes the focus, and so on. Negative signals ensure that this positive feedback does not engage before cell pairing, which would lead to cell lysis. Dudin O, Bendezú FO, Groux R, Laroche T, Seitz A, Martin SG. A formin-nucleated actin aster concentrates cell wall hydrolases for cell fusion in fission yeast. J Cell Biol. 2015 Mar 30;208(7):897-911. doi: 10.1083/jcb.201411124. PMID: 25825517. Dudin O, Merlini L, Martin SG. Spatial focalization of pheromone/MAPK signaling triggers commitment to cell-cell fusion. Genes Dev. 2016 Oct 1;30(19):2226-2239. PMID: 27798845. Dudin O, Merlini L, Bendezú FO, Groux R, Vincenzetti V, Martin SG. A systematic screen for morphological abnormalities during fission yeast sexual reproduction identifies a mechanism of actin aster formation for cell fusion. PLoS Genet. 2017 Apr 14;13(4):e1006721. doi: 10.1371/journal.pgen.1006721. Apr. PMID: 28410370. Merlini L, Khalili B, Dudin O, Michon L, Vincenzetti V, Martin SG. Inhibition of Ras activity coordinates cell fusion with cell-cell contact during yeast mating. J Cell Biol. 2018 Apr 2;217(4):1467-1483. doi: 10.1083/jcb.201708195. PMID: 29453312. The merging of the two cells’ plasma membrane is arguably the defining point in cell fusion. While a number of fusogenic proteins, which directly promote cell-cell fusion, are starting to emerge in various organisms, the fungal fusogen(s) remain enigmatic. We aim to discover the mechanisms of plasma membrane merging in yeast. How do zygotes prevent engaging additional gametes? This is critical to ensure genome maintenance across generations. We found that the fusion of P and M gametes leads to the rapid reconstitution of a bipartite transcription factor in the zygote, which blocks re-fertilization. This transcription factor consists of a M-cell-specific peptide Mi and a nuclear P-cell-specific homeobox protein Pi, which captures Mi in the P nucleus post-fusion. This asymmetric design leads to inherent asymmetric zygotic gene expression, which initiates first the Pi-containing nucleus. Delaying zygotic transcription leads to zygote fusing with additional gametes, thus forming polyploids and eventually aneuploid progeny. We are currently dissecting how the signaling cascade initiated by the onset of zygotic transcriptional bifurcates from meiotic induction and blocks mating behaviors. Vještica A, Merlini L, Nkosi PJ, Martin SG. Gamete fusion triggers bipartite transcription factor assembly to block re-fertilization. Nature. 2018 Aug;560(7718):397-400. doi: 10.1038/s41586-018-0407-5. PMID: 30089908. New preprint out on BioRxiv! Gaowen obtains HFSP postdoctoral fellowship! Copyright © 2019 The Martin Lab. Powered by WordPress. Theme: Accelerate by ThemeGrill.